In this tutorial, you'll get started with Android room. Room is an ORM or abstraction on top of SQLite database. It's part of the Architecture Components by Google. Room enables you to easily work SQLite databases in Android. The Room persistence library acts as a layer that abstracts raw SQLite and lets you make use of robust database access while keep you close to SQLite so it doesn't get in the way when you want to access low level features of SQLite. Android Studio 3.0 or later installed on your machine. You also need to be familiar with Android Studio i.e how to create, build and run/emulate a project etc. An Android device or emulator if you don't wan to use a real device for testing. Let's start by creating an Android project using Android Studio. After syncing gradle, you'll be ready to start creating your Android application. In Room, you create Java POJO classes instead of SQL tables and you decorate them with the @Entity annotation. 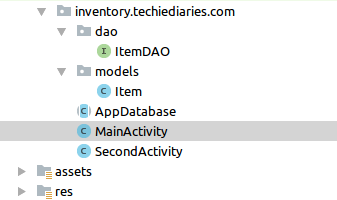 DAO refers to Data Access Object which is a class that's responsible for performing CRUD operations on the Room entities. You can create a DAO by creating a Java interface and annotate it with @Dao. You can insert or update a variable number of items. Room allows you to execute custom SQL queries. For example, let's add a method that returns all available items in the database. We need to create an abstract class that extends RoomDatabase which will provide access to the implementations(s) of the DAO interface(s). In this tutorial, we've seen how to create a simple Android demo that uses Room for persisting data within a SQLite database.